Unique, beautiful, absolute paradise. 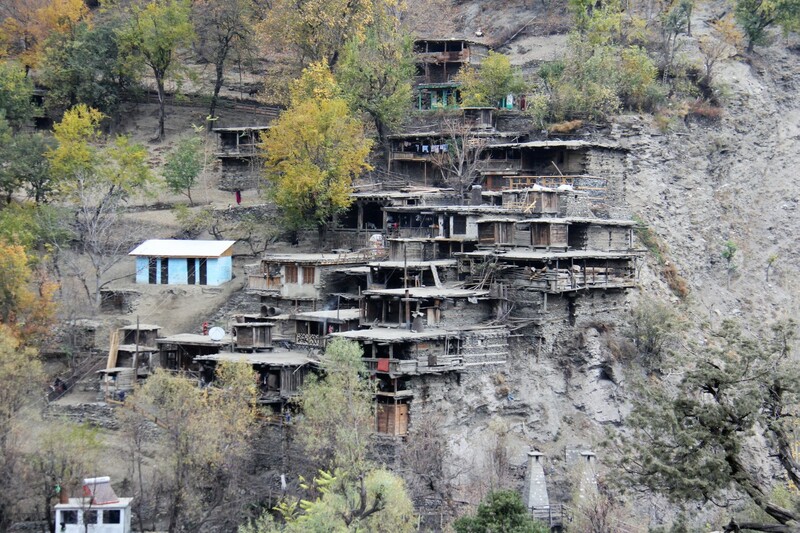 These are some of the expressions used to describe the Kalash valleys. When I first came here in 1980, I probably used the same ones. In those days there was no electricity, no running water, no latrines, no bazaars, only hair raising jeep tracks (they still are! ), no hotels or guest houses. I knew every water channel and mountain path in Birir. There were no walls, no hedges or fences to bar our way. 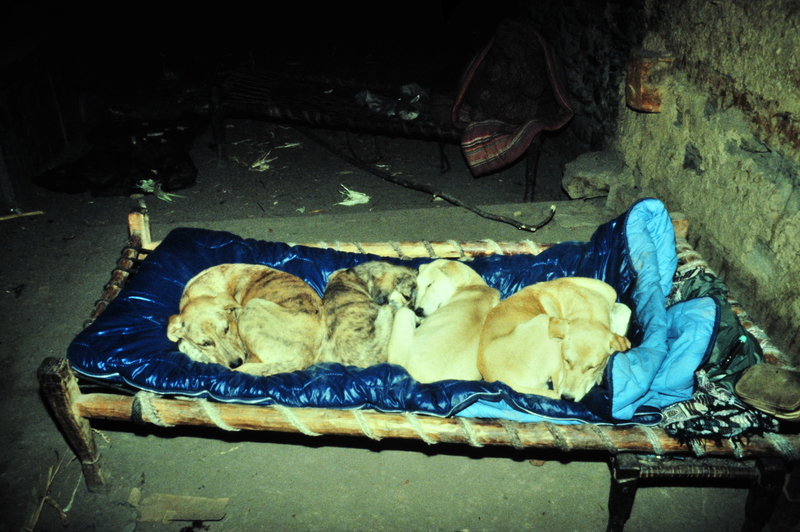 My dogs ran free beside me. A few plank bridges enabled us to cross over the river. In those early days I played the role of the ‘barefoot doctor’ and treated the ailing and the sick. My first companions as a barefoot doctor. At that time there was plenty of protein although less in Birir than in the other two valleys. 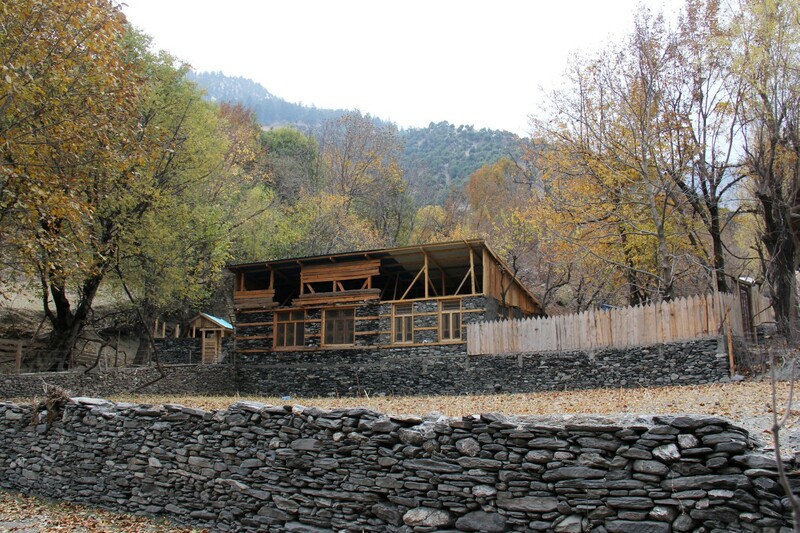 In Tak Dira’s house, where I stayed, there was always yoghurt, cheese, milk, walnuts and beans (no eggs as chickens were taboo in Kalash society). Rice, which has now become a staple food for those better off than most, was then a luxury and we only had it when I brought it in from Chitral. Meat was rare and mostly consumed by men and only at weddings, funerals or festival time. Then much later on, I moved across the river to live in Tak Dira’s daughter’s house, as her husband built me a splendid room, for which I gave him what would now be a pittance. In those days, Grubinasa had only two houses in the middle of fertile land between the river and the hills. Now Grubinasa is a village of some fifteen houses. Everywhere in Birir there are fences and walls. I would no longer be able to travel freely around the valley. The same is happening here now which happened in Britain in the 19th century. There is no open common land any more, and people are protecting their property from any possible encroachment. Along with that is, like everywhere else, population explosion. Also, when the eldest son marries, he soon tries to leave the extended family and build his own house. 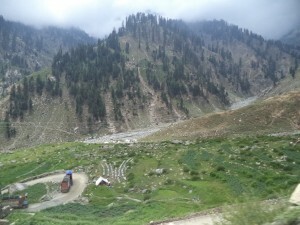 Deforestation in Upper Dir (see over). With this also comes deforestation and climate change….. Goats have always been the main stay of Kalash economy along with agriculture. Due to deforestation, more movement, disease among the goat population has increased. People’s herds have dwindled. Since the roads came (in Birir it was in the sixties) the barter system gave way to the monetary system. Less land, less crops, less livestock, lack of income and problems began to multiply. In the nineties, foreign tourists found us and several summers we had something like between three thousand and five thousand western tourists. This brought income. People built small guest houses and tourists often befriended me and would give me money to buy medicine. After the missile crisis, during Clinton’s tenure, tourism fell, and then started to revive, until 9/11 – the day the world changed. A false flag operation so say the families of the victims and architects. So, there in essence, you have the story of what ails the society of the valleys – a story repeated the world over. My grandfather always said if America sneezed, Britain would get the cold. Now it’s as though if America sneezes the whole world is affected. 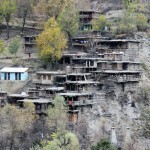 I used to think, that tucked away in these mountains, the Kalash culture would survive, along with the people themselves. The signs are full of foreboding…..globalization and climate change will affect the people adversely. Pakistan is one of the country’s most at risk from the latter. Since 2010, we have witnessed terrible floods. Almost half of Bumburet has been completely washed away. Child mortality has improved enormously due to better sanitation, more awareness and better access to doctors. This, however, has had a blowback effect. With the population increase, it has become obvious, that the land can no longer sustain so many people. With both pastoral and agro livelihoods in danger, the youth have to find employment, so good education is a must. Having come to recognize this quite forcibly, due to climate changes (this year, there was not one grape in Birir, hence none of the famous red wine) and Grubinasa becoming a baby crèche, I now know that building our school was a very important contribution. I have been asked a number of times, why I had decided to build a girls’ high school. We were sitting on the logs just outside our new house. I had moved with my friend, Gul Akthar, her husband and four children, away from the house of the extended family, within a few months, the husband was dead due to a fatal accident managing the small electric power station. Myself, Sainisar (my builder’s wife) other Kalash friends and my Peshawar driver, Janus, were enjoying some chai. Sarjima, Gul Akthar’s eldest daughter, was moaning about the local primary school which was only about a hundred metres distant. Where was she going to continue her education? This bright twelve year old had a point. There was no Middle or High School for girls in the valley. I shrugged my shoulders. ‘I guess you will have to go to Chitral.” I said unhappily. “Unless you can get the govt to build one here,’ I added laughing. ‘Me?” ‘Impossible!” Janus remarked. Gul Akthar slapped me on the back. I turned to her and Sajima and looked in their faces….Oh, no, I thought. I stared defiantly at Janus. “Hell, why not?” So the idea was born, but it was to take another six years before our dream would become a reality. The building has now been completed except for the electricity. A new hydro-electric power station has been built, but the people of the valley do not like to have to pay monthly bills! They can’t afford to. I am hoping we can use solar panels for the school. We also need a programme of teacher training, as the ability of the present incumbents leaves something to be desired. Classroom 2 and the final classroom have been joined together. As we are going to be subjected to even more intense flooding (being tucked away in the mountains is not so wonderful when the glaciers above you start melting! ), retaining walls are a must. 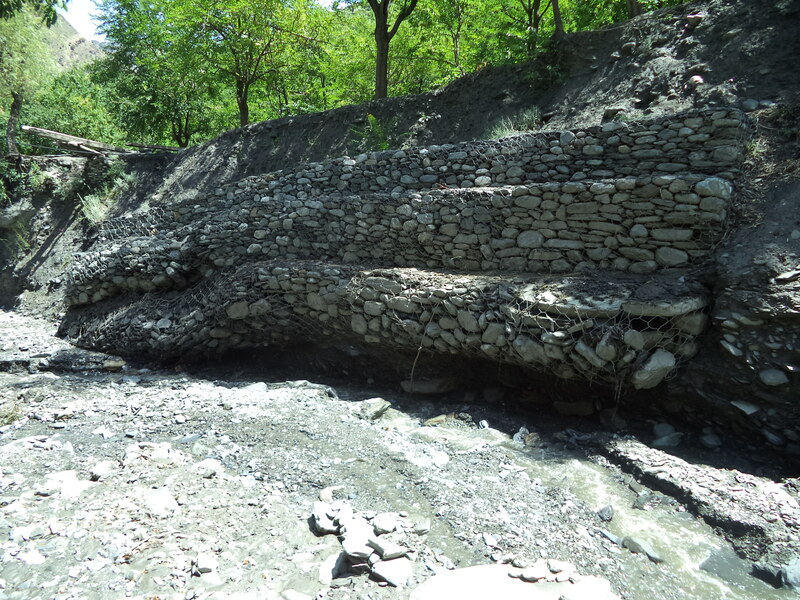 One of our school retaining walls AFTER the flood. Only the bottom section was damaged. Guru village amazing house structures. Tourism can bring income as it once did. Guru Village should have its own museum. The village itself we hope will become a World Heritage Site. I have struggled for years to keep the village intact and then lo and behold, money given by a wealthy philanthropist to the leaders (read money chasers) to help their village, ended up with four latrines painted a lovely colour of light blue….. (I have been struggling also for a sanitation project for houses which do not have one). We cost them at less than ten thousand rupees. The cost of these four latrines was four lakh – R4,00,000…… This was against my advice, but….. now they blot the landscape and destroy the chance of a WHS. Plus, as I have said many a time, communal latrines bring disease. So one project for next year is to replace them and put them (without the blue paint) in a less conspicuous place. Now there is talk again of repairing or demolishing the famous landmark, the Gahiret Bridge – built by the British, started in 1912. 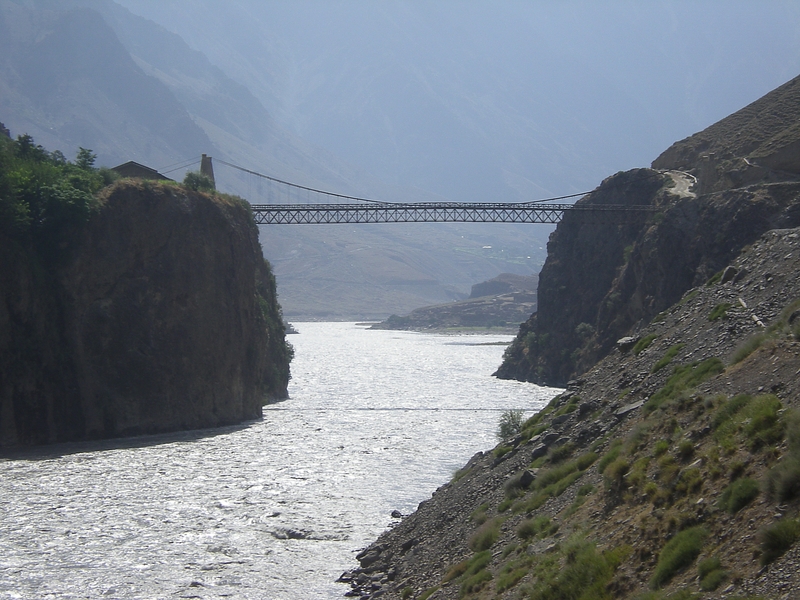 I repaired it in 2006, but due to the loads of smuggled wood going across, it again needs repairing – another job I wish to do, as well, is to repair Guru bridge which we built in the 1990s. Talking of projects…. I remember in my youth, those older than myself would talk about ‘.job satisfaction.’ My work now if full of highs and lows. 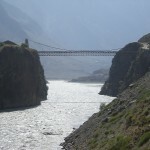 When young women from Birir, who had married men of Rumbur and Bumburet, would come back and tell me that both valleys preferred my projects to any other NGO, organization or Govt, as I did professional work and did not force my ideas on anyone, like the outfit who introduced Punjabi goats (all destined to die) and cherry trees. I found this most heartening. For those who are interested, we are including a list of projects we have undertaken. Next spring we start work replacing the old bashali. The women refused to let anyone else do it!! Still so much to do. It was with great sadness that I learnt of the death of our wonderful District Commissioner, Osama Waraich in the air tragedy last month when all passengers were killed. He was a man everyone could really work with. 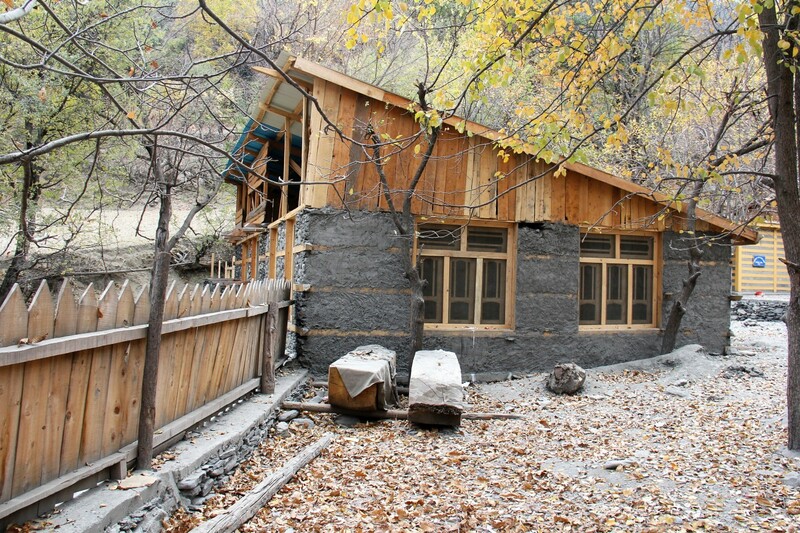 LIST OF PROJECTS – Since she arrived in the Kalash Valleys 30 years ago, Maureen Lines has initiated an amazing number of projects for the benefit of the Kalash people. In the early days as can be seen, the Embassies in Islamabad were major supporters but gradually this support dwindled due to the threat of terrorism worldwide. More and more the funding gap has been filled by HKCA.